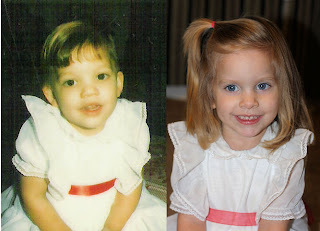 My Mom made this dress for me when my adoption was final and I was able to be sealed to them. She saved it in a ceder chest all these years. I came across it about a year ago when my Dad was going through things. He said I could take it if I wanted it. Really who would not want something like that? I managed to find a Polaroid of me in the dress. I haven't seen any others of me in this dress at all. I imagine there might be more in my parents ten million boxes of pictures. I don't have very much of a memory of the day I was sealed to my parents other then I was dressed in all white and somewhere in the back of my mind I remember playing with my brothers in the temple nursery. It's times like these that I wish my Mom was here to see Madi in the dress and to tell me about what was obviously a very special day. Its that special sacred day that makes it possible for me to see her again someday. Love the pictures Krys. Wish she was here to tell you too. This post was so sweet! I never knew your mom but if she's anything like you- she's pretty amazing. wow, I love this post! How neat to have these pictures. Just think how Madi will feel when she puts her daughter in it. I have a dress that my mom, myself, sister and now my daughter and two nieces have all been blessed in. It's great to have these links through the generations!